Nine Steps to a Calm, Relaxed, Quiet Canine. Have a Go at DRO. I like quiet, calm dogs. Most owners I know want quiet, calm dogs. Visions of a dog cuddling during a relaxing evening shatter with the reality of a pushy, loud, obnoxious pest. Where classes are concerned, pestering pups embarrass owners. I like my classes quiet so I don’t have to yell over the ear piercing, migraine inducing screaming of an out of control, demanding dog. Typically, owners are offered a long list of tips ranging from increased exercise, busy toys, supplements, gadgets and massages. Sufficiently exercised, some dogs fall asleep. A sleeping dog isn’t well mannered. It’s just sleeping. When they wake, we’re back to pestering. Owners can feel like they have become the dog’s personal entertainment center. Perhaps we should use training instead? Many owners try rewarding an incompatible or alternate behaviour. For example, the dog that is lying on a mat cannot be clawing at your legs. However, I like to use something a little different because DRIs and DRAs can create behaviour chains. The dog swings back and forth between good and obnoxious behaviour like a pendulum on a clock. Pester – treat – pester – treat – pester – treat. When I get noisy, hyperactive, unfocused, pushy, pestering dogs in classes, I start them on a Differential Reinforcement of Other Behaviour (DRO) plan. It uses positive reinforcement to reduce unwanted behaviours. 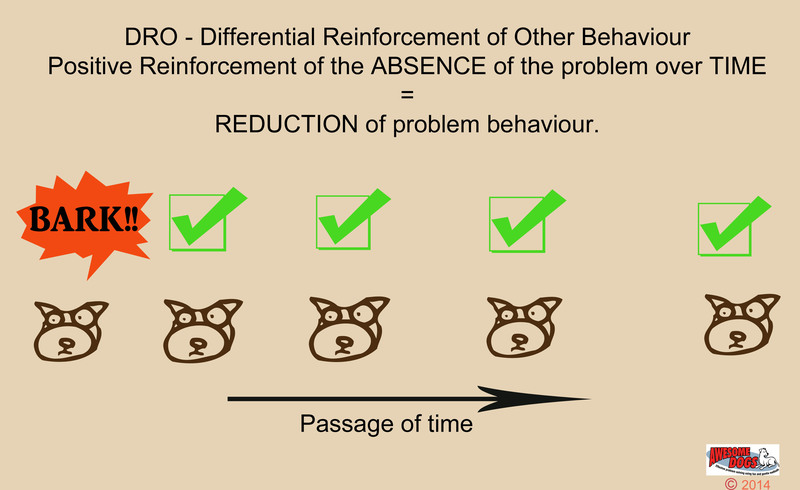 The absence of a specific problem behaviour over time is reinforced. DRO’s work on a wide array of problems from barking, pawing, pushing, bouncing at the end of a leash and more. I do not however use it with dogs with fear and anxiety problems that would be better served through desensitization and counterconditioning. What many fail to realize is that a DRO rewards TIME, not RESPONSES. Simply reinforcing the absence of a problem doesn’t address that we want the dog to behave for a prolonged period of time. Let’s use barking as an example. We do not want to create a dog that barks and hushes, looking for a treat each time it quiets. We want a dog that stays quiet. Our criteria is not the absence of problem behaviour. Our criteria is the absence of problem behaviour over time. Dogs can absolutely learn time based or temporal criteria. Back to our barking dog, we might begin by rewarding short periods of quiet. It does not matter if the dog is sitting, standing, spinning, chewing a bone or doing a headstand. If the dog remains quiet for a pre-determined length of time, they earn their reward. Gradually, we would ask the dog to stay quiet for longer and longer until barking rarely, if ever, happens. Close attention to passing time prevents the dog from learning that they can bark and hush to get a cookie. That’s because we are being very clear that our criteria is not the act of becoming quiet, but the act of staying quiet. The dog is free to do any safe, appropriate behaviour it likes – so long as it is quiet. The same goes for any other nuisance behaviour we seek to eliminate. A well executed DRO follows a process and some rules. There are variations based on the type and timing of reinforcements. This is the one I typically use in classes and at home with my dogs. Step six: Aim for A level student grades. The dog should be right at least 80% of the time. We want the dog practicing appropriate behaviour, not rehearsing the problem. Step seven: Continue to re-evaluate progress and measuring the dog’s responses. Ask for longer duration of appropriate behaviour as the dog demonstrates that they are ready. Stay at each level until the dog is consistent. Step eight: Switch to a random schedule when the dog has developed sufficient duration. Step Nine:: Generalize the behaviour in various locations as needed. Count! Do not eyeball this exercise. As your dog improves, you can increase criteria more rapidly. If the dog is not hitting A student level, decrease your expectations. Make it easier. Be careful not to reinforce other nuisance behaviours. For example, if you want to eliminate barking, be careful that you are not rewarding pawing or jumping. If the dog engages in too many alternate problem behaivours, reduce your time criteria. Problem behaviours may initially increase before dropping off dramatically. During initial stages,ignore other training goals. Once problem behaviour disappears, you’ll have plenty of time to teach new things. If the problem fails to improve, communicate with a qualified pet professional. It is possible that the dog is misbehaving due to medical problems or anxiety issues. Perhaps one of my favourite parts of executing a DRO in group class is watching the dogs. Young, powerful, adolescent dogs barking en masse and too distracted to learn anything start to breathe. Their muscles relax and the room goes still. The owners are stunned that for the first time ever , their hyper dog has gone from a maniac to sane – a cool dude lying by their feet. It happens in a class of other dogs. A DRO is how we taught Kipper the ex-crotch ripper to settle quietly at the end of a busy day. Sometimes we get so focused on telling the dog what to do, we become micro-managers instead of teachers. Sometimes we forget that we often don’t actually care what a dog is doing, so long as it’s appropriate. Often we forget about counting – the time factor. It’s a shame we don’t focus on time more often because frankly – it’s really effective. Results are often dramatic and can come quickly. If you want to eliminate any number of nuisance behaviours, remember to keep one eye on a clock. Next Next post: Do you love me for the treats? That’s really interest. I used that method to teach my dog loose leash walking, only I didn’t have a name for it then. Started with a treat for every 3 seconds not pulling, worked our way up to 5, to 7 etcetera, until we got to the point where pulling was the exception and not the norm. I never read anything about it, it was just what I came up with because nothing else I tried worked. Reblogged this on Come. Sit. Stay!. Reblogged this on Learning With Dogs. Hi Yvette I though DRO was the reinforcement of other behaviours , meaning any or other behaviours besides the one the dog presents and we wich to reduce. So in a barking dog we would reinforce any other behaviour the dog offer, such as silence, sit, down, look, whatever that is not barking. This definition that DRO is reinforcing over time a desirable behaviour, may I ask where did you get it from? Thank you so much for the article! There are various schedules of DRO. The one you are describing is not often used because nothing really that motivates the extinction of the problem. Many resources online. This video link is a really easy on and has an example of it being done with children. Notice the “time” condition. The following handout is nice and straightforward. Yes, there are many variations. Reinforcing “other” without a time condition just doesn’t seem to be used much. You can have variable interval, fixed interval and many tweaks to a DRO. Adding in the “time” factor really offers what I find to be a nice, fast way of getting calm. Then you can switch to using R+ to build new behaviours. Especially in class I find that helpful. Chaotic classrooms aren’t very good learning environments. If the dog can calm down and start to focus, then people can start working on other things. Brilliant article Yvette. Even professional trainers (including me) can have a beautiful chain happening before we know it. DRO rewards time, not responses – GOLD 🙂 Thanks for the reminder. Thanks for this good information. Too often we do set up behavior chains when trying to stop annoying behaviors like barking or jumping because we do not consider the time factor. We definitely must remember to keep one eye on a clock! This is a superb article and very much appreciated! I want to thank you for your clear and concise overview of DRO!